High power light emitting diodes quickly became the new standard in providing an artificial light source for photosynthetic animals in our reef tanks. 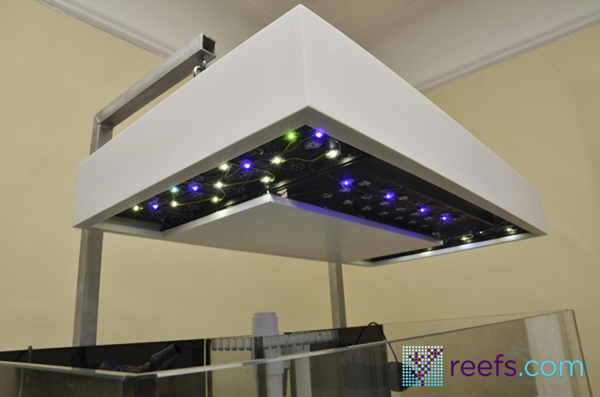 Most emitters output enough light to grow almost any coral in captivity, thus aquarium LED manufacturers shifted their focus to the software part of their lights in order to sell their product. Therefore, it’s all about control now… All images by author From sunrise & sunset dimming to thunderstorms, cloud passing and various other lighting effects, there are endless possibilities to control LED panels. 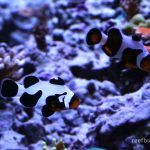 Add to this several emitter color options and you end end up with a true 70’s disco experience… Having the possibility to fine tune your light temperature and intensity is undoubtedly a desirable feature in aquarium lighting. 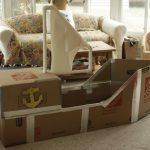 Where do DIY LED projects place themselves in terms of control-ability? Are we left behind? Well, thanks to controllers like Neptune Systems Apex , we are not. Better, thanks to Apex’s simple programming code and variable speed ports, fine tuning LED circuits is on par or could even be superior to commercially available fixtures. Before I proceed with the rest of this article I need to take a brief pause and state two things: a) first of all, the Apex code I will present to you later in the article is a slight modification of an existing code written by another reefer that asked to remain anonymous; I found this particular code to be both ingenious in it’s simplicity and quite complex in it’s abilities. Therefore, my personal “thank you” to that person for letting me modify and present that code in the article b) at this point, I am assuming you have the required skills to build a dimmable LED light and the ability to wire in a rj45 socket to connect with the Apex main unit. I also assume you have the basic Apex programming knowledge necessary to understand and use the code I’m about to write. I had to made those two assumptions in order to focus on the topic of this article and keep it reasonable in length. If you wish to learn about building a DIY LED light, refer to my build journal or countless other manuals found on various reef forums. For Apex programming, I recommend reading the great Comprehensive Reference Manual. 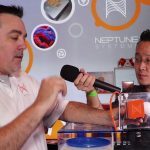 http://www.neptunesystems.com) OK, we are past the legal stuff, let’s continue with the hardware part of the process. 1. At least one LED string wired to a dimmable driver; two strings if you would like to have separate channels for white and actinic diodes. You can go even further and have separate strings for various color LEDs if you wish to. Sky’s the limit ( or rather number of different color variations LED manufacturers introduce to consumer’s market). When it comes to the LED driver, and this is very important, you need a dimmable driver that can receive a 0-10V analog signal. My build uses MeanWell 60-48D drivers (please note the “D” at the end of this driver’s model number, this is the one that uses an analog signal to dim LEDs. Meanwell sells this model in a 60-48P version, where the dimming is handled using a digital signal called PWM and it’s not suitable to be dimmed by an Apex controller (unless you convert the PWM signal into an analog one, but that’s additional electronics to purchase and the build becomes over-complicated, in my opinion). Meanwell is the most popular choice for DIY LED builders, but if you have another driver that can be dimmed using a 0-10V analog signal, you can use it as well. 2. 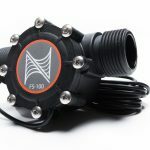 Neptune System Apex Aquacontroller. On the base unit (the one where you plug in all other expansions and probes), there are two ports labeled V1/V2 and V3/V4. Those are variable speed ports that output the earlier mentioned 0-10V signal required to dim the LED strings. One port is capable of controlling two individual LED channels, so if you have only white and actinic LEDs in your build (or mix in color LEDs with whites and near UV ones with actinics as I did), you need only one port & one cable to dim them both independently. 3. Ethernet socket and cable. 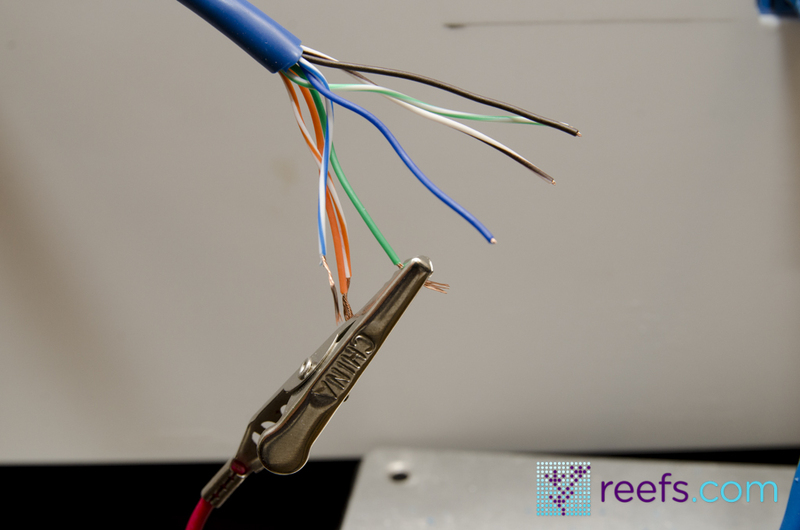 In order to make a connection between your LED unit and the Apex controller, you need to buy an ethernet socket that has either solderable points or push in pins to attach wires from the drivers. It should cost around $1-2 and it can be purchased many places online as well as at your local home improvement store. The ethernet cable is another few bucks (depending on the length). If you happen to have a spare one from an old router or modem, it will work just fine too. 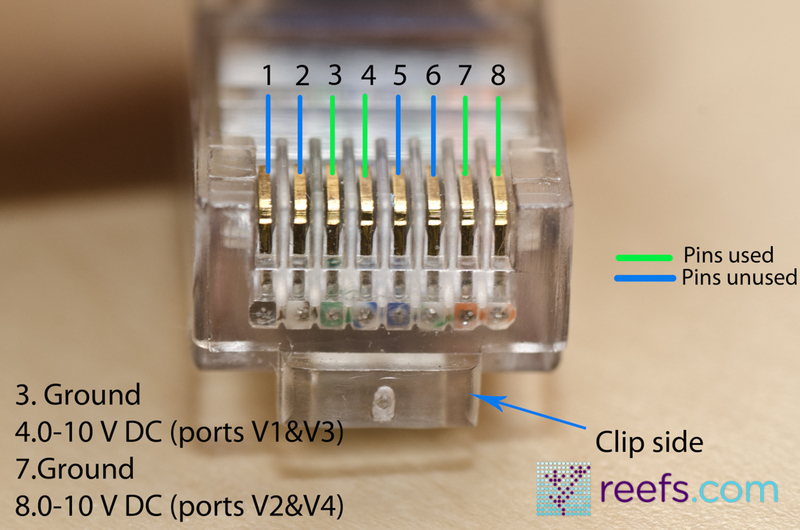 As I mentioned before, I’m assuming that you have all the necessary equipment and skills to wire in an ethernet socket with your drivers so let’s skip to the actual process. 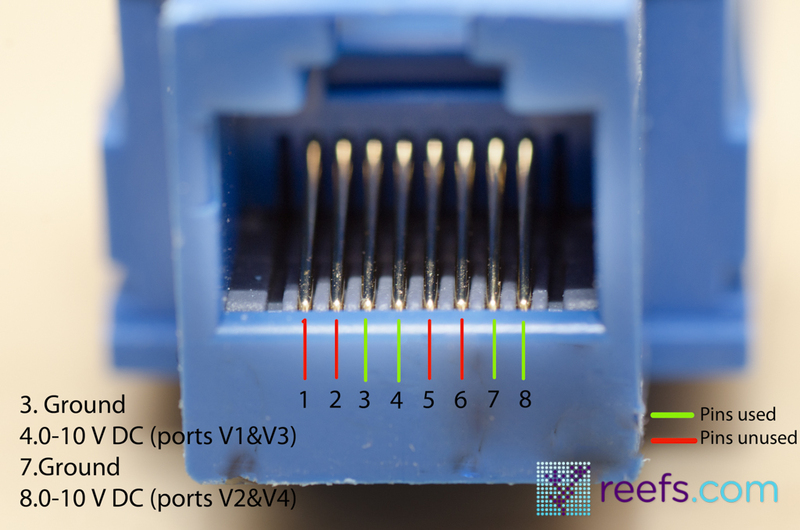 The ethernet socket has 8 pins and the cable has 8 wires, respectively. Apex uses only 4 of them, 2 for each dimming channel. When you look on the front of the socket so the little notch is facing upwards (see drawing), the pins are numbered from left to right 1-8 (if they aren’t, try to write down where pins number 1 and 8 are). The Meanwell 60-48D has two dimming wires:Blue colored DIM (+) and White colored DIM (-), those are the ones that have to be spliced with ethernet socket pins. You can splice driver dimming wires together and use only one dimming signal for all of them (as many as 8 Meanwell drivers have been hooked up to one dimming channel without any problem) . Refer to the diagram below for the correct connection schedule. 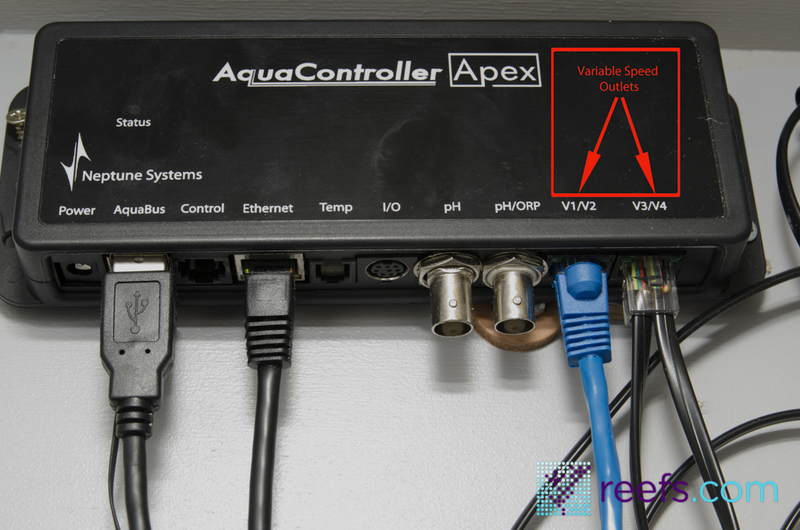 Quick reminder, one physical port on the Apex can dim two separate channels, which sums up for the total of 4 channels per module. 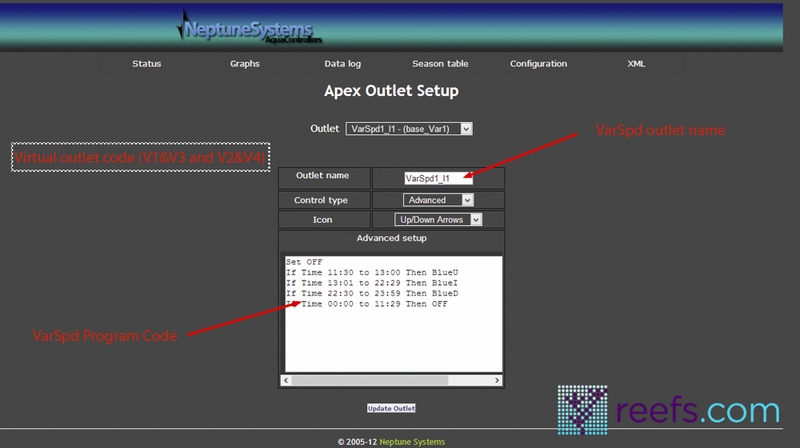 If your build requires more than 4 channels, you can purchase additional expansion modules from Neptune Systems. Check all connections twice and when you’re sure everything’s correct, you can proceed to the software part of the build. Witth dimmable LED drivers and Apex’s programming capabilities we were able to build and program a versatile, fully controllable LED fixture. You can tweak the light intensity and color temperature to your liking, create a smooth transition from total darkness to midday sun brightness and adjust “the blues.” More than that, nothing stops you to go one step further and modify the code to simulate moon phases, cloud passing and lightning storm effects. All that by adding new and modifying existing profiles. 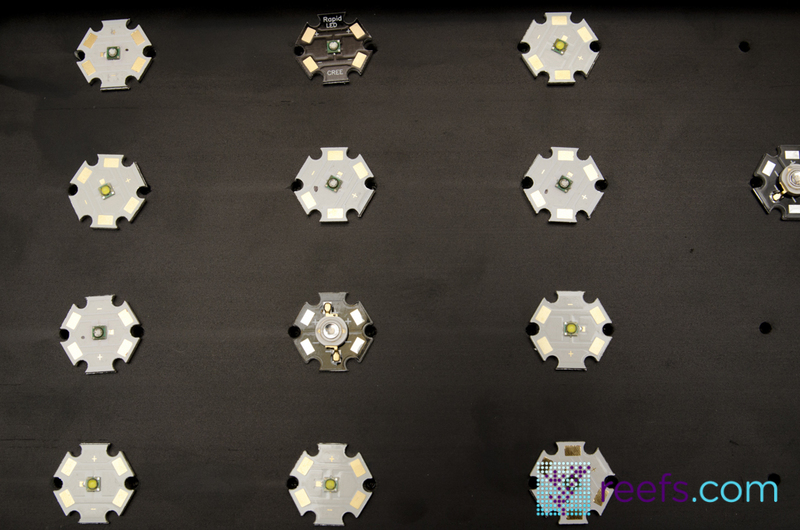 You can also add more channels using color LEDs to further expand the light spectrum. 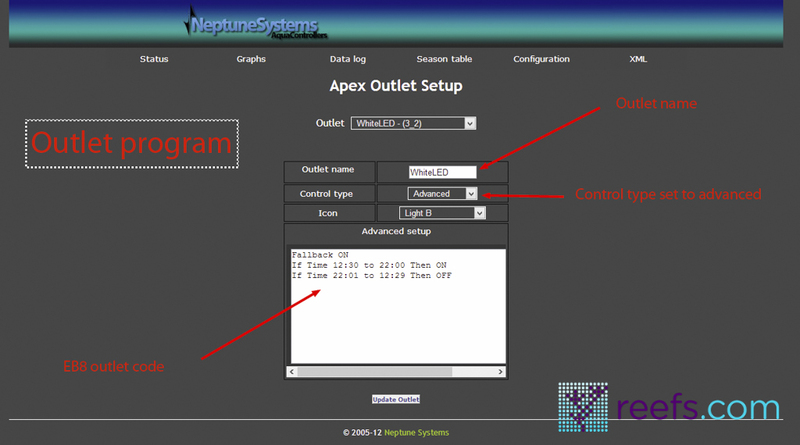 I hope that this article helped you understand and use the Apex programming language to build LED lights. Don’t hesitate to contact me directly or comment here with any questions or suggestions you may have. Happy DIYing!!! Note: There is an upcoming update to Apex website, once it’s released I will point where to look for the programming parts with the new interface. Apex is a trademark of Neptune Systems. Really awesome article, your best yet.